This one is from the bleeding obvious department but it’s noteworthy nonetheless. The Nielsen Company’s latest Three Screen Report, which tracks consumption across TV, Internet and mobile phones, says that in the last quarter of 2009, Americans’ simultaneous use of the Internet while watching TV reached three and a half hours a month, up 35% from the previous quarter. 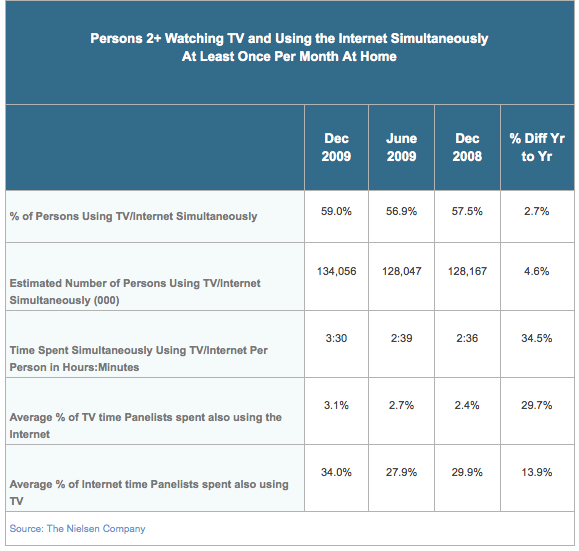 “Nearly 60% of TV viewers now use the Internet once a month while also watching TV”, notes the report. Now I won’t regurgitate the other stats (see the table below) but I will point a finger at the likely culprits: Laptops, or more specifically Netbooks, and handheld devices such as the iPhone and other smartphones, and let’s not forget the iPod touch. Along with social networking sites (Facebook, Twitter etc.) giving rise to the virtual watercooler viewing experience. The same ‘couch computing’ craze likely behind Apple’s decision to release a tablet computer, the iPad, now and in its particular form-factor. 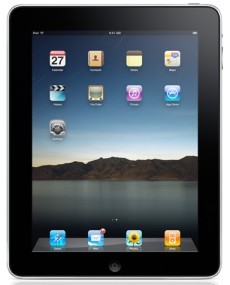 See also: People keep asking… what do I make of Apple’s iPad?